Running in Pattaya, Thailand. Best routes and places to run in Pattaya. 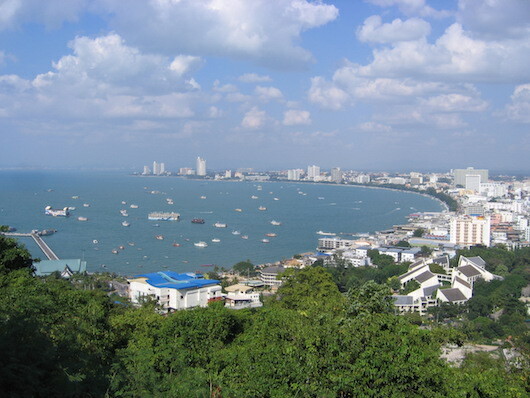 Pattaya is a resort city on the east coast of the Gulf of Thailand, located 100 km southeast of Bangkok. Rapidly growing and developing, the place is a mix of beachfront hotels and towers, shopping, and some seedier elements. 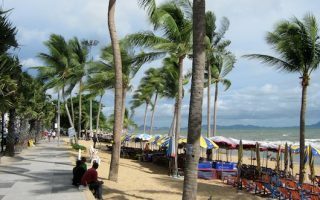 The best places for running in Pattaya are the wide beach-side paths along Pattaya Beach and Jomtien Beach. 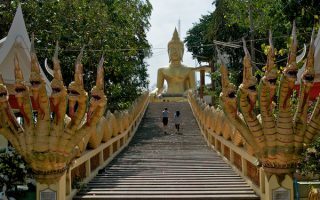 It’s also fun to take a hilly run up Phra Tamnak Mountain and around Buddha Hill to enjoy great views and see the Golden Buddha and Giant Buddha. We’ve also researched some of the best parks and roads that that are good for running in Pattaya and vicinity. 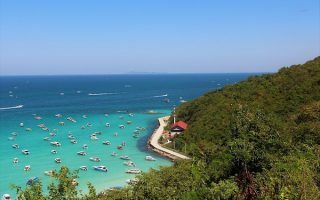 Ko Lan Island, a 45-minute ferry ride from Pattaya, is a popular day trip — and features some nice beach and road running there. A couple of notes about running in Pattaya: the weather is hot and humid nearly year-round — best to go early! Many of of the roads in Pattaya are congested and don’t have a sidewalk, so please use caution. Also, there can be petty theft, so be careful about carrying money/phone. The signature run in Pattaya. 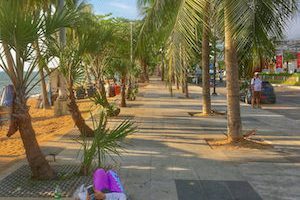 A wide, palm-lined path runs between Beach Road and the beach, and is always a festive scene. It's 5.8 km one-way, to the Pattaya Viewpoint. Water views nearly the whole way. Another great beachside run in Pattaya, this tree-lined path follows Jomtiensaineung Rd. along Jomtien Beach for 6.5 km. Good surface, some shade, and water views the whole way. The beach is also runnable. A green park, hilltop views of Pattaya Bay, and two giant Buddhas all in one run! Run the hilly paths and stairs of the park, then head up Phra Tamnak Mountain to see the Golden Buddha, and then the other way up to Big Buddha. A selection of the parks in the area that are decent for running. Pattaya Fitness Park and Nongprue Public Park are closer by. 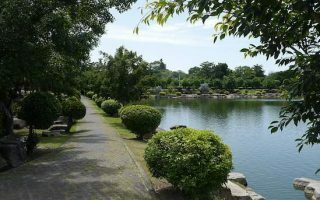 Pattaya City Park has 1 km of trails, combine with Huai Chak Nok Lake. Khao Mai Keao Reservation Park is good for trail running. Other than the lovely paths along the beach, the roads in the Pattaya area aren't great for running. They tend to be congested, and few have decent sidewalks. We've researched the most runnable roads in the area. A small island about a 45-minute ferry ride from Pattaya, known for its lovely beaches set against wooded hills. Nice beachfront running on Tawaen Beach, and Tien Beach to Samae Beach. We've also put together an 'island tour', with some optional hills! The year-round heat and humidity of Pattaya must be taken into account from a running perspective. Average high temperatures are in the 30-32C (86-91F) range year-round, and nightly lows rarely dip below 24C (77F). There are distinct wet and dry seasons, with little rainfall December-March and abundant rainfall May-October (especially September-October!). This is a major tourist destination, so there is an abundance of lodging of nearly any stripe. From a running perspective, try to stay within a km or so from the Pattaya Beach or Jomtien Beach waterfront roads/paths. 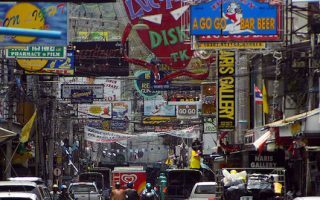 Since Pattaya is a shopping destination, you’ll be able to find running gear at outlets and factory stores of major shoe/apparel companies: Under Armour, Nike, New Balance, Puma, and more. Pattaya Marathon. July. More than 10,000 runners in this popular marathon. Pattaya Trail Half Marathon. June. Fun trail run in neighbourhood, plantation, and through the forested hills of Khao Pai. 12 km from Pattaya.